I’ve been coming into the topic and conversation of war in the last week. Twice at least. On Sunday I chatted with a Kurdish friend and got some thoughts on his perspective of the Second Gulf War. Being Kurdish, it was understandable to hear him say that yes, he is glad the United States went at the Ba’ath regime, Saddam Hussein and his two sons (I reminded myself out loud that Saddam was, to put it mildly, a super-jerk and no friend of the Kurds). As John Stuart Mill reminds us, though (and this is paraphrased), when the bullets start flying in a war, all chaos breaks loose and there is barely a modicum of reason, restraint and control. Innocent people die. And it is terrible and it needs to be acknowledged. I have found that it is best to chat with individuals about their individual experiences in war when it comes down to it: ears open and mouth closed. Wars are complex and terrible things. This last Sunday, my Kurdish friend had some remarks on it all but he had to take off. He said we’ll sit down and have a dinner and a conversation about it all some time. I agreed. 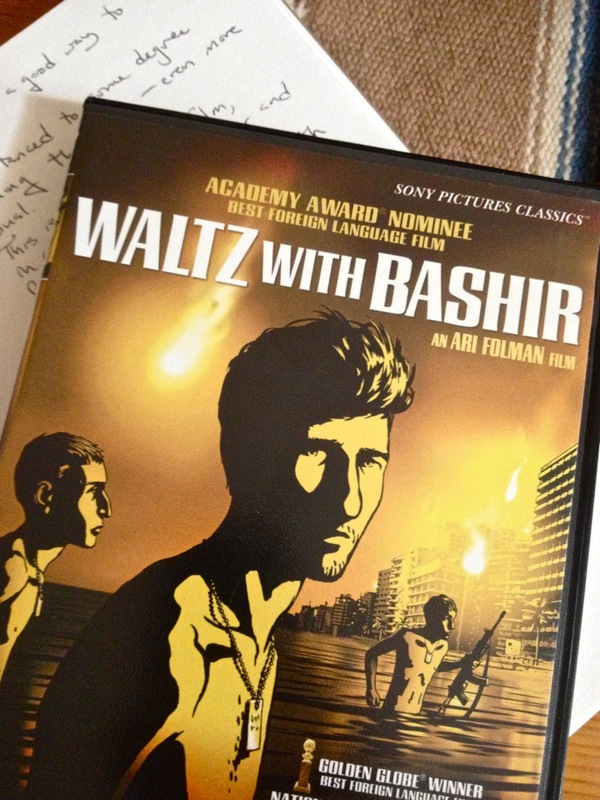 The second encounter was yesterday evening when I had a chance to watch Ari Folman’s 2008 film, Waltz with Bashir, this a work of remembrance of the First Lebanon War (1982). The film eventually takes the viewer to the horrors of the Sabra and Shatila massacre. If you haven’t seen this movie already, you should. Note: it is an adult topic — war, and the horrors intrinsic to it and remembrance thereof. Within the film, a female psychiatrist (at least I think she was a psychiatrist) was having a conversation with a friend or patient, and she was remarking on how a soldier dealt with war by treating it, in his mind, as one would treat a vacation. She referred to this as the soldier’s “camera,” and psychologically the soldier was able to deal with processing the immediate carnage this way (think Christopher Browning’s 1998 monograph, Ordinary Men: Reserve Police Battalion and the Final Solution in Poland). When the soldier came across a Hippodrome of slaughtered and mangled Arabian horses (ravages from the war), the soldier’s psychological camera, she said, broke. This mental shift caused the soldier to look at everything as it was, the change in perspective pulling him into the reality of what was going on. I thought about this and Ari’s use of cartoon to tell this story of remembering The First Lebanon War: impressionistically, a viewer of the film understands this is a serious topic of war. But Ari’s use of cartoon gives the viewer distance. And then toward the end of the film, gravity returns as Ari uses actual footage from the Sabra and Shatila massacre, this carried out by Lebanese Christian Phalangist militia in Beirut. Once again, see this film. It is important. This entry was posted on Tuesday, July 9th, 2013 at 9:19 am	and tagged with Civil War, Dakota Wars, Memory, Remembrance, War and posted in Uncategorized. You can follow any responses to this entry through the RSS 2.0 feed.